Could a banshee's wails be heard in the darkened streets of Toronto? The banshees or the Bean Sidhe (woman of the hills) find their place of honor in Irish folklore. She is looked upon as an omen of forthcoming death to an Irish family. She is often heard late at night as a cry or singing. The cry has been described as "a thin, screeching sound somewhere between the wail of a woman and the moan of an owl"* Although she is often heard rarely is she actually seen. When she is seen though she appears to take the form of either a young woman, a matron or an old woman, this going back to the Celtic goddess' appearing as the three stages of a woman's life, either as a young beautiful woman, a woman in full bloom of her life or motherhood, and the crone or old wise woman nearing the end of her life or life cycle. Legend has it that "the banshee can only cry for five major Irish families: the O'Neills, the O'Briens, the O'Connors, the O'Grady's and the Kavanaghs. However, there have been some others; intermarriage has since extended this select list"* She is also said to appear as Bean-Nighe or washer woman. If she is seen as Bean-Nighe she is usually seen washing what appears to be blood from the clothes of the person who is about to die. She is said in most of the legends to be dressed in a green dress with a grey clock over top. Her eyes are told to be bright red and her hair appears as grey and stringy. She is widely believed to be a spirit or fairy that brings the family news of the coming death. 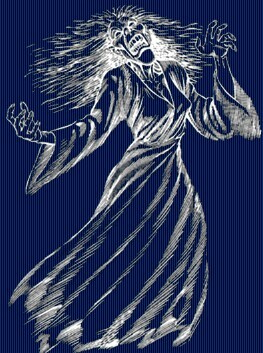 As times change and the years go on many Irish families have moved to many parts of the world but the legend of the banshee is that she will never leave the family that she is connected too, So even on the streets of Toronto it may be possible to hear the haunting sounds of banshee as she cries and warns the family. "This happened about 15 years ago. (Webmaster's note: We received this report in 2006) My husband was away with the navy and I was alone with our four children. My story starts with me being asleep in bed one night. I was woken up by a loud, eerie wailing noise. At first, in my half asleep state, I thought it may have been a neighbourhood cat but it was so loud that it sounded like it was outside my bedroom door, so I got out of bed and walked towards the hallway in the dark. For some reason I wasn't scared. The wailing now sounded as though it was in the direction of the lounge, so I followed it (just like in the movies) down the hall and through the dining room and into the lounge, still in the dark. It was still very loud as if it was just in front of me but it kept moving as if I was to follow it, so I did. It was a very sad sound. Once I was in the lounge, it sounded like it was coming from outside, so I drew back the curtains and over the road from my house was something I d never seen or heard of before. It was the head of a lady with hair that was about six feet or more across. She was white with a tinge of blue and her hair was blowing slowly about, even though it didn't seem to be windy outside. Her hair looked like it would be if she was floating on water. Her face was the saddest face I've ever seen. She was an old lady and I could see her wrinkles clearly even from the distance I was from her. It was pitch black outside but she shone, in amongst the trees, as though she had a spot light on her. She wailed so sadly, like she was crying for a long lost family member. I pulled up a chair to the window and watched her for a good ten minutes and she slowly faded and disappeared. I had no idea at all of what I had seen, so the next day I had a look through my ghostie books. I found a picture of what I d seen the night before. I thought it was funny that I d never seen the picture in the book before but didn't give it much thought. She was called a Banshee. Apparently, these apparitions appear to you when someone close is going to die. I'm not a superstitious person but I got scared and was so protective of my children that they got really sick of me. Three weeks later our extremely healthy family Labrador died from a heart attack for no apparent reason. I didn't tell my children what I had seen in case it frightened any of them and they were all still very young. Eventually, I forgot about it and about 10 years later my daughter was telling me she had seen a thing just over the road from where we lived, in a different house this time and during the day. When she described it to me, I knew she was talking about a Banshee. Her very favourite cat died not long after she'd seen it!" Our thanks to the witness (Julie S.) and her daughter for sharing their reports with us. Also my mother has seen a banshee in Belfast were we used to live. She heard a high pitched screaming like a cross between a cat and a baby crying. She looked out of the window and saw across the road from her, what appeared to be a small old woman. The woman only came up to the window sill, so about 4' high. My mother could see the brickwork of the house through the woman, as the woman was made of a smokey substance. The woman continued to make the crying sound and my mum watched for a while, before returning to bed. The next day my mother told a nearby relative, who informed her that the lady who lived in the house were my mum saw the banshee had died the previous night. And also informed my mum that she had witnessed a banshee. Both of these incidents took place in the 1960's. Also my sister, mother and myself have heard banshees (in Northern Ireland). Usually before someone dies. The sound is unmistakable. Again as I mentioned before. Incredibly loud and like across between a cat and a baby crying. Very frightening. Very loud. Loud enough to make the glass in the upstairs bedroom window rattle as if it's going to smash! The last time we heard it was in the 1980's." Our thanks goes out to our reader for sharing this personal family account of the Banshee with us. A dramatic reading inspired by this page. Enjoy!